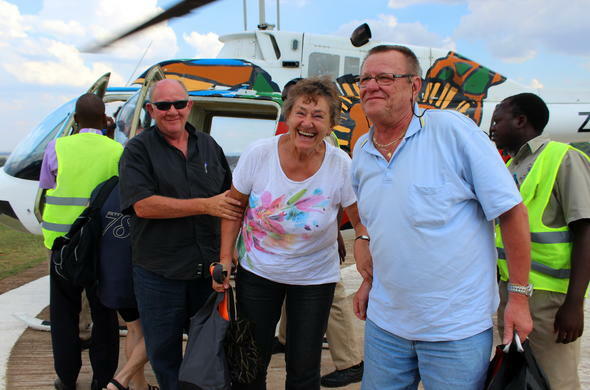 Happy guests returning from a Helicopter flight over the Victoria Falls. Payment may be made via Credit Card or Bank Transfer. We only accept credit card payments via our Secure Online Credit Card Payment Platform. Alternatively payment may be made via Bank / Wire Transfer to our various currency bank accounts. For more information please see below. Siyabona Africa is proud to offer our clients the seamless convenience of a secure Online Credit Card Payment Platform that is safe and easy to use. We use 3D-Secure - a payment system created by MasterCard & Visa - which safeguards your personal information and banking details. 3D-Secure gives you an extra level of protection against unauthorised card use when making online purchases. Siyabona Africa does not access nor store your credit card details; payments are processed by the credit card acquirer and issuing bank in a secure environment. Visa/Mastercard sends your credit card information via a highly encrypted transmission, to be stored on a secure server, behind a powerful firewall. 3D-Secure verifies your identity before accepting your payment. All encryption is compliant with international standards and the payment gateway which we use to process your card details is completely secure and verified by Thawte (www.thawte.com). Click on the personalised link created for you - it will take you take you through to our easy, step-by-step secure online platform where your quote number and amount due will already be pre-filled. After submitting - your financial institution will authenticate the transaction. You will receive a one time password (OTP) on your mobile/email. Once you have entered your one time password (OTP), simply follow the steps as you normally would to complete the transaction. Your bank will verify your request and the transaction will be completed upon successful validation. If your credit card is not already registered for 3D-Secure you will need to activate your MasterCard/Visa credit card with your bank before making an online payment through our 3D-Secure Online Payment Platform. 3D-Secure is also known as MasterCard Secure or Verified by Visa. After you register, you can use the security code for all your online transactions. Payment may be made via Bank Transfer in any of our business accounts as per your invoice. We currently offer you the convenience to pay into one of our currency accounts - ZAR (South African Rand), EUR (Euro), USD (US Dollar) and GBP (British Pound). Foreign Electronic Bank Transfers may take between 2-3 working days to clear. When making a bank transfer please inform and instruct your bank that the invoice amount must equal the funds clearing into Siyabona Africa’s bank account and that all nominal bank charges are for your account. If you have been quoted in ZAR but would like to make payment in USD, for example, please let us know and we will convert your invoice to reflect the correct USD amount.